We Hire The Top 5%. Welcome To ‘The Best of the Best’ In Kansas City Remodeling. We’re very careful about who we hire to remodel kitchens and bathrooms. VERY CAREFUL. And we’re not just talking about background and drug tests, although we insist on both. We typically interview AT LEAST 20 people for every 1 hire we make, which means that less than 5% of prospective hires are allowed to join our elite team. So why do we spend so much time making the best hiring decisions? Because in kitchen and bath remodeling, the quality of your team is the single biggest factor in the results you deliver. A lack of experience or a slipshod attitude towards the details can ruin a project faster than anything else. 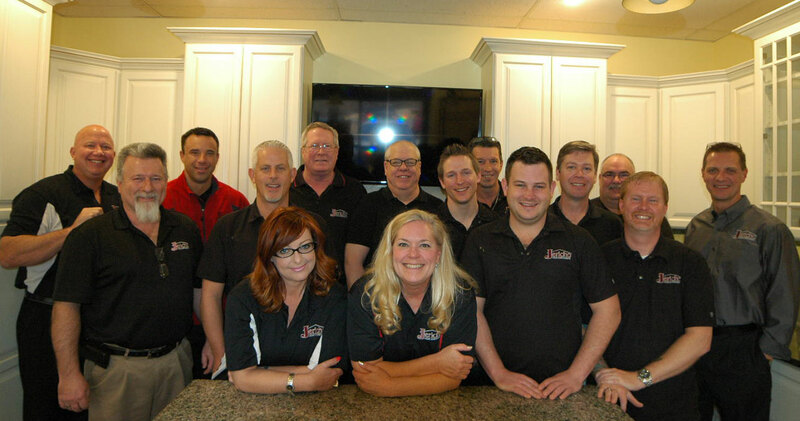 Our commitment to hiring the best is demonstrated by our incredible team of Master Installers. These Master Installers must be able to handle all parts of the job because of the unique way we install our kitchens and bathrooms. Instead of having 5 to 10 sub-contractors parading through your kitchen or bathroom at different times doing different parts of your remodel, we have our own Jericho Master Installers that are employees not sub-contractors. They are experienced, cross-trained experts that can handle every detail of your remodel. That’s why we insist on Master Installers who are truly… masters. So finding this kind of elite talent isn’t necessarily easy – they average at least 15 years’ experience specifically in kitchens and bathrooms… and they have to have serious skills in several areas. That’s why most remodeling companies in Kansas City take the “easy” (and inefficient) way and use sub-contractors instead. In addition to our elite Master Installers, we have also carefully built a top team of designers and office support people. The kitchen and bath remodeling designers are exceptionally skilled at listening to what you want and then making the right recommendations for your budget and tastes. The office support people are well-trained to avoid the typical frustrations of “I don’t know” answers. (And if they really don’t know, they’ll get you to the right person). The typical customer service frustrations that are so common nowadays are not the Jericho Way. There’s one more qualification that we look for in ‘Our People.’ It’s admittedly a little hard to define exactly, but we know it when we see it. And we bet you do, too. We call it “the nice guy (or gal) factor.” We want nice people who are pleasant to be around. We find the day is much more pleasant when you work with lots of nice people, and it builds a positive momentum of great attitudes. You’ll feel this affirmative energy in all your interactions with Jericho Home Improvements, the friendly kitchen and bath remodeler. If you’re ready to work with the friendly, highly-qualified Kansas City remodeling team, give us a call. We’d be honored to give you a free design consultation and quote.